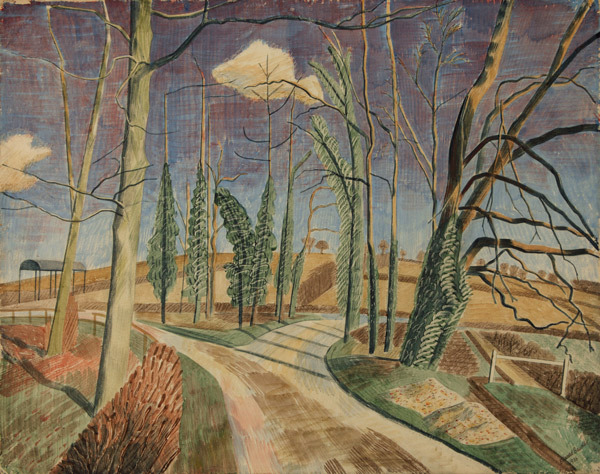 The exhibition about Edward Bawden at the Dulwich Picture Gallery in South London finishes on Sunday 9th September - and if you've not seen it yet and can do so, I urge you to get along to the Gallery to see it. It's a fabulous exhibition. I saw it this afternoon with Felicity House and we enthused our way around the show - finding lots to like and lots to marvel at in terms of how he worked and what he produced. First a few notes about Edward Bawden - not from the exhibition but rather from online sources which you can investigate at your leisure. He studied at Cambridge Art School and the Royal College of Art, was taught and mentored by Paul Nash at the RCA and was a member of the Bardfield set which included Eric Ravilious. The exhibition is not based on a time line - instead it has themes. This gallery included a lot of work which employed collage within mixed media works in ways which were both very impressive and very stimulating! I particularly liked his one oil painting in the exhibition called By The Sea. Apparently it's very rare. It's also a very happy picture with some extremely fine observation of how people behave at the seaside on a beach and in the water. According to this Daily Telegraph Object of the week article about the painting it's a representation of how his family used to spend their summer holidays at Clacton-on-Sea in Essex. His Map of Scarborough - made for a hotel - is monumental and very innovative - and contains very small studies of people enjoying their time at Scarborough as well as the whales and mermaids out in the bay! 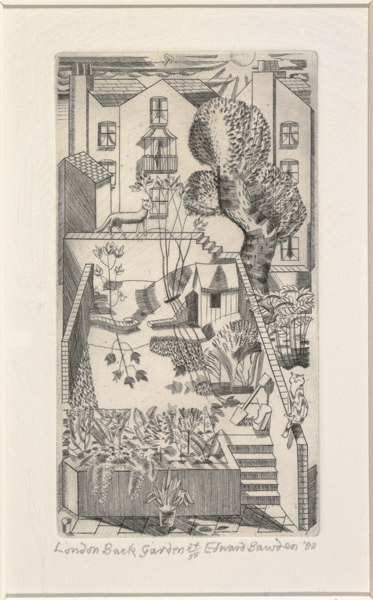 I loved his small miniature like etchings of aerial views of back gardens with implausibly thiun boundary walls and a lot of detail. 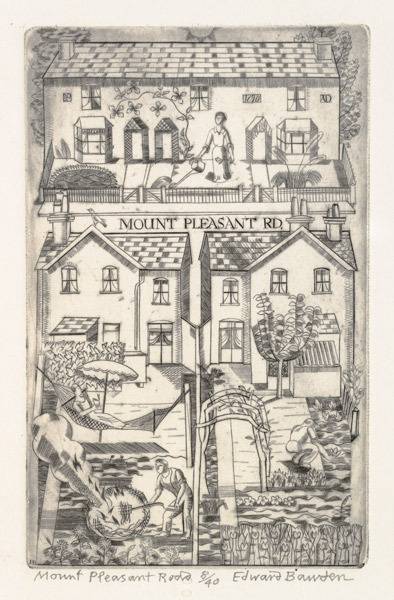 Bawden was the master of very fine hatching on copper with an engraving tool. 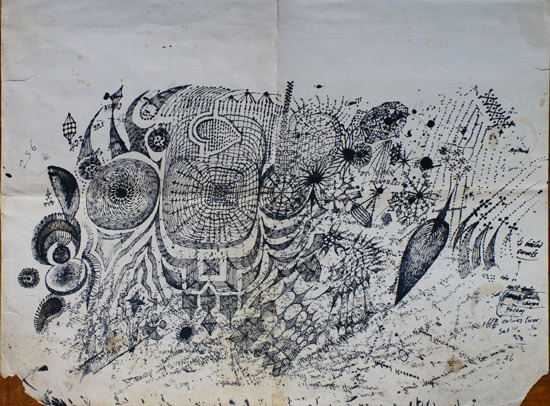 His drawings contain a multitude of different marks to indicate different subject matter and surfaces. Naturally two cats infiltrate the back garden..... as they do! February 2pm is a marvellous and vigorous watercolour painting of his back garden of his home The Brick House in winter. It has amazing scratches and scribbles. 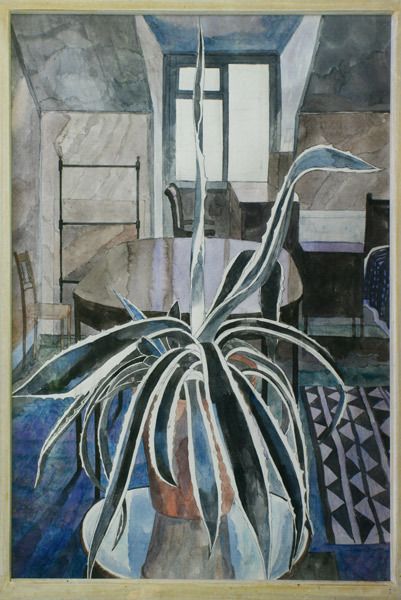 Both Felicity and I really liked his watercolour painting of an Agave. Its natural form collides with its very structural background. This section of the exhibition is dominated by two places - Great Bardfield in North West Essex - and the area around and about - and Newhaven in Sussex which Bawden very much liked for some reason. We were pleased to see the comment that much of his work was created while out and about - and puzzled at the commentary in the exhibition which we both felt over-analysed this painting. It contrasts with the explanation in the catalogue which seems more balanced. 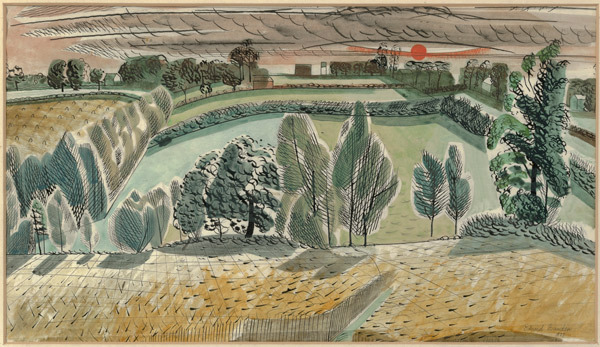 Bawden painted what he saw and what he imagined. I don't think he indulged in too many metaphorical exercises at any stage. If the light and sky are somewhat weird that is what appeals to a painter - to record the moment. That's very often the top and bottom of it! One of the marvellous bits of the exhibition is the video captured of Bawden creating his huge linocut of Lindsell Church (also in the exhibition). The linocut is far too big to go through the press and consequently the video shows us the foot pressing technique he devised to enable him to print linocuts. It's a technique which would be well worth studying by all those who cannot afford a decent press! I'd never really thought of Bawden as a portrait artist before - and yet, while working as a war artist, he produced some astonishing portraits of soldiers from the UK and allied troops and auxiliaries. His talent for observational drawing when it comes to Africans and those with dark skin is simply stunning. Some of the best I have ever seen. He demonstrated his talent in depicting dark skin by using blue to bring out the life within the skin colour rather than relying as so many do on various shades of brown. Bawden obviously had a fascination with architecture. He also uses a panoramic format to pull of some of his most accomplished artwork. I looked at the interior of Liverpool Street Station and marvelled. More than a decade ago I used to do a class at the Prince's drawing School called Drawing the Bigger Inner Space - and subject matter was either the interior of St Paul's or the interior of Liverpool Street Station. Drawing it was a HUGE challenge which makes his artwork all the more impressive - from one who knows! Much of the work in this section is linocuts. Others are drawings. 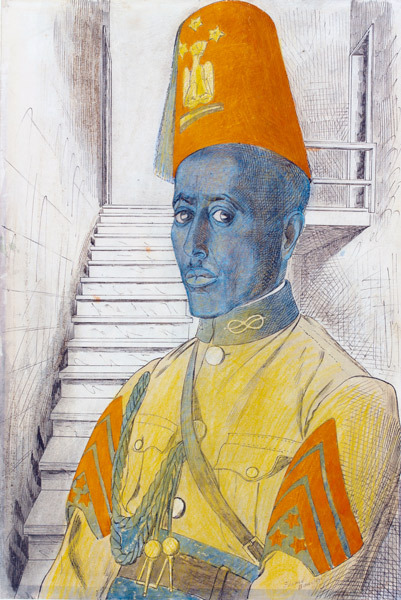 The one we found most impressive was the watercolour, ink and pastel on paper of Menelik's Palace: The Old Gebbi which distorts the perspective within a panoramic format - and belongs to the Imperial War Museum. It's a study of the one time residence of Ethiopian Emperor Haile Selassie. The end of the exhibition is devoted to his monochrome drawings and prints and some of his more commercial work. 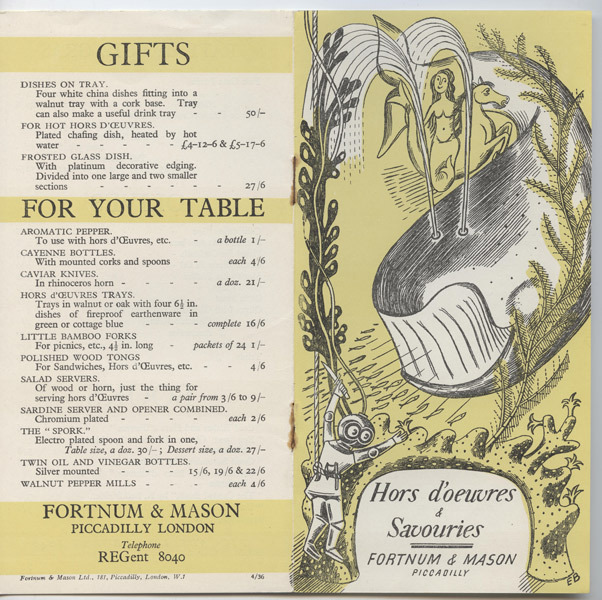 It's important to remember that Bawden was also a commercial illustrator with a great sense of the graphic. He created a vast number of illustrations for a wide variety of clients (some very prestigious eg Shell, Fortnum & Masons) and for a various products - from book covers to brochures to drink mats and wallpaper. A decorative image for a gift catalogue for essential items for Hors d'oeuvres and Savouries - like Caviar knives - for Fortnum and Mason. There's also an exhibition Bawden at Home at the Fry Art Gallery in Saffron Walden until 30th October - and having had a great afternoon at Dulwich I'm now minded to take a trip up to Saffron Walden. Who knew Giles from Gogglebox was an artist?